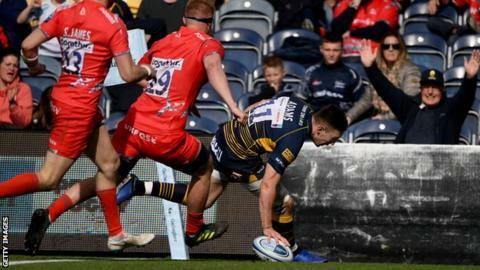 Josh Adams claimed his first Premiership hat-trick as Worcester eased their relegation fears with a bonus-point win over Sale. Worcester edged seven points clear of danger as they earned a third win in their past four Premiership home games. After first-half tries from Sam Lewis and Chris Pennell, Josh Beaumont crossed the whitewash for Sale. But three second-half tries from Wales Grand Slam winger Adams turned it into a bonus-point win. Warriors had Bryce Heem yellow carded but their 14 men held on comfortably. Toulon-bound winger Heem, like Cardiff Blues signing Adams was binned for an ugly tip tackle on Paolo Odogwu late on that could easily have brought a red card from referee Ian Tempest. But it was fellow winger Adams who stole the final headlines, when he completed his hat-trick in the dying seconds. Had Newcastle won at home to Leicester on Friday night, Warriors would have started the day bottom. But, having avoided that fate, and looking duly uplifted, the hosts put in a suitably buoyant performance. Welsh flanker Lewis led the way when he was fed by Francois Hougaard from a line-out to place his third Premiership try of the season under the posts. Duncan Weir then added a conversion and a penalty before full-back Pennell added a second try - his fifth of the season. Beaumont got Sale on the board, AJ MacGinty adding the extras, to allow Sale to trail only 17-7 at half time - a 10-point home advantage that remained the same after Weir and MacGinty swapped penalties. There was a great chance for the Worcester bonus point when Heem and Francois Venter carved Sale open, only for Pennell to spill with a clear 15-yard run to the line. But Adams then went in again, and, although Matt Postlethwaite came off the bench to get a second Sale try, Adams had the final word. Having started the week with a dead leg from the Wasps game, which he shrugged off after a week's treatment, he became only the the second Warriors player to claim a Premiership hat-trick. "We knew we'd let ourselves down against Wasps last week and I knew we'd play well, from the moment we turned up to training on Monday. "I've always said that, if we can play to the best of our ability we're a match for anyone in this league and we were in the right frame of mind right from the off. Josh Adams is a class player, we saw that in the Six Nations. (Bryce Heem incident)"What it looked like was a yellow card but it's very difficult to see km just a split second and I have not had a chance to see it again." "We were beaten by the better side. They were desperate for a win and they were better than us in every aspect of the game. "If we win our two home games then we'll be in Europe but we need to turn up better than we did here. "[On Bryce Heem incident] If you land on your head, it's a red card, isn it? Chris Ashton got a seven-week ban for less than that. "We went to the RFU disciplinary the other week, working on the balance of probability, with Rob Webber having a bite mark on his hand, and Newcastle got away with it, so I'm not too fussed what they do." Replacements: Singleton, Black, Milasinovich, Kitchener, Hill, Heaney, Lance, Howe. Sale: James; Solomona, S James, van Rensburg, Reed; MacGinty, de Klerk; Harrison, Webber, John, Beaumont, Phillips, Ross (capt. ), B Curry, Strauss. Replacements: Langdon, Morozov, Jones, Postlethwaite, Moore, Cliff, Redpath, Odogwu.